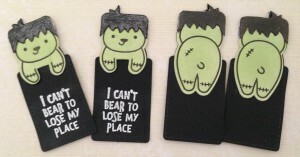 Because I am crazy, I decided to make every student in my class a bookmark for Halloween. I think they turned out super cute, but they were fairly time consuming. Extra Details: I began these bookmarks, by stamping the front and back of all the bears on some white card stock. I used a mini ink blending tool and some Lawn Fawn Celery Stick ink to color all of the bears. I stamped the stitches on the bears next. I die cut the bears using the matching dies. I stamped the monster hair on a separate piece of paper. I used colored pencils to color the hair and then fussy cut them out. I painted the edges with a back marker to hide any cutting errors. I die cut the book marks from some black cardstock. I adhered the front of the bear to the book mark, and then added the monster hair. I adhered the back of the bear to the back of the book mark. I adhered the hair, making sure to line the back hair to the front hair. I trimmed the ears and tag holes that stuck out from the hair with my scissors. Lastly, I white heat embossed the sentiment on the front of the book mark. I plan on sign the back of the book marks with a white gel pen. I saw this sentiment on a My Favorite Things stamp set. 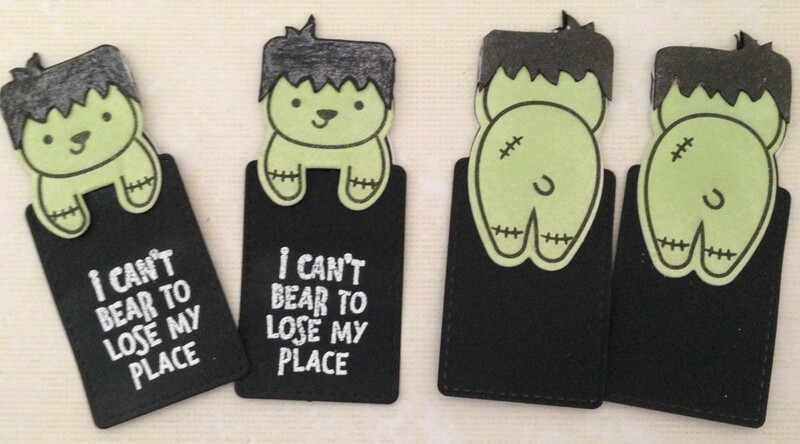 It is soo cute and perfect for October. Extra Details: I began this card by die cutting two stitched rectangles; one from black card stock and one from white card stock. 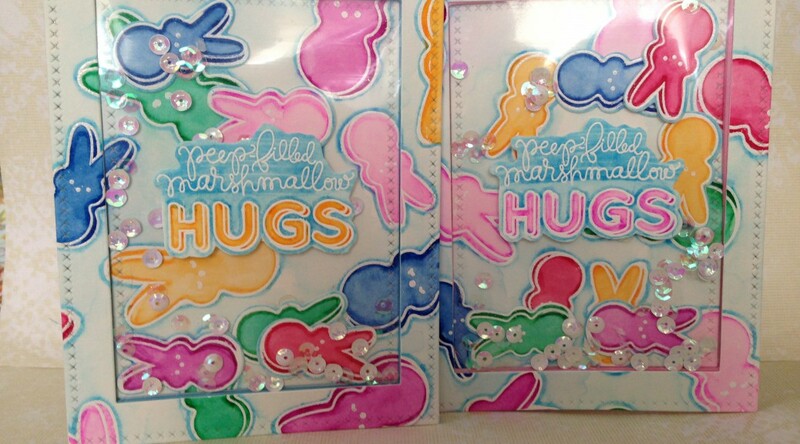 I also die cut the letters for ghost hugs from water color paper. I used Distress Inks to water color the letters. While the letters were drying, I stamped and white heat embossed the beginning of the sentiment on the black rectangle. 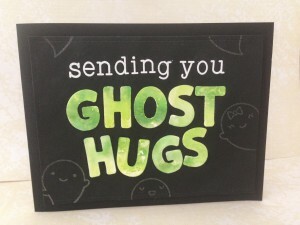 I used glow in the dark embossing powder to add the ghosts. They are much more subtle in real life. I glued the letters down to the black panel. I used fun foam to adhere the panel to a black card base. I used an alpha stamp set for the inside sentiment. 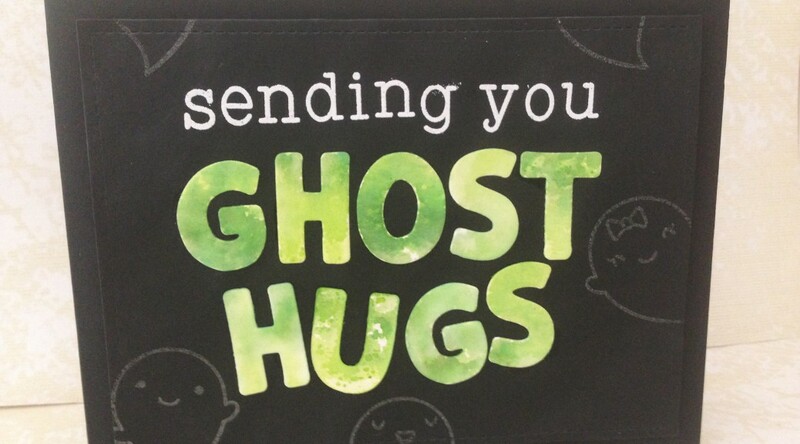 I added some ghosts in a light grey ink and then adhered on the inside of the card base. 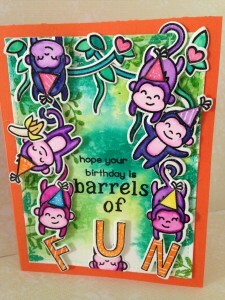 Birthday, Challenges, fun with paper and ink, holiday fun, Lawn Fawnatics Challenges, LOVE! This is a birthday card for one of my very best friends. She loves purple, monkeys, and all things a little over the top. 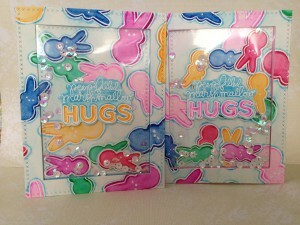 Extra Details: I began by stamping and clear embossing all of the images. I used Crayola Fine Line markers and a water brush to water color everything in. I used a white gel pen, to add some details to the party hats and letters. Once the images were dry, I die cut everything out with the matching dies. I die cut two stitched rectangles from some water color paper. Once was for the front of the card and one was for the inside liner. I used three shades of green Distress Ink to ink smoosh on the front panel. Once the smooshed ink was dry, I added some leaves using two of the same Distress Inks. Then, I began creating my scene. I glue the vines and bottom monkey to the panel with liquid glue. I used dimensional glue dots for most of the monkeys. I used thin foam tape for the letters. Once, I had the main images on, I tucked in the extra leaves and hearts. Then, I stamped the custom sentiment. Thank goodness for the Misti! I double stamped the sentiment to make it really stand out against the ink smooshing. 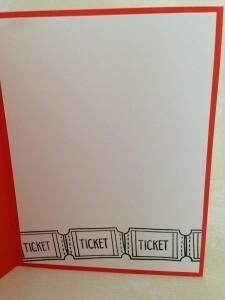 Lastly, I adhered the panel to an orange card base. 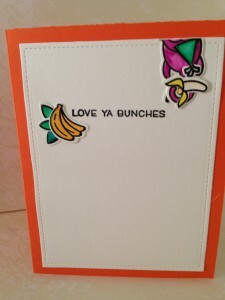 For the inside panel, I stamped the sentiment and adhered an extra bunch of bananas and some leaves. I couldn’t let that adorable monkey but go to waste so I adhered that to the inside panel with another banana. 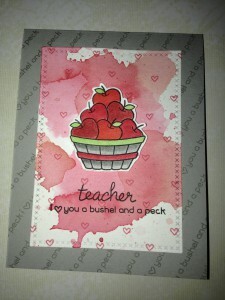 Challenges, fun with paper and ink, LOVE! 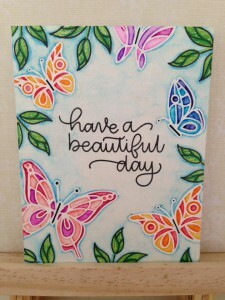 Today, I decided I need to use up some of the pattern papers I have left over from Simon Says Stamp Monthly Card Kits. Extra Details: I began this card with a panel of white card stock. I die cut a larger stitched rectangle first. Then, I cut four smaller rectangles to create a frame. I used the same small rectangle die to cut four pieces of patterned paper. I used a small heart die to cut hearts from each of the papers as well. I cut a scripty thanks die from three of the four papers. I adhered the frame to a white card base with foam tape. 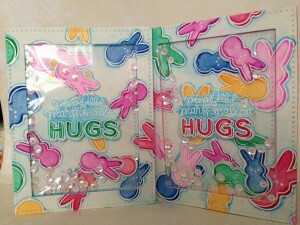 I inlayed the color rectangle and adhered the hearts in the corners using liquid glue. I adhered the three thanks die cut together; slightly offsetting them, so that each color could be seen. I adhered the die cut to the middle of the frame using more liquid adhesive. Then, I set the panel aside to dry. I stamped the fairies on some water color paper and used Crayola Fine Line markers to water color them in. I stamped the dresses on another piece of pattern paper form the same collection. I fussy cut each dress out, painted the edges and adhered it to a fairy. Once the glue was dry, I fussy cut the fairies out leaving a small white border. 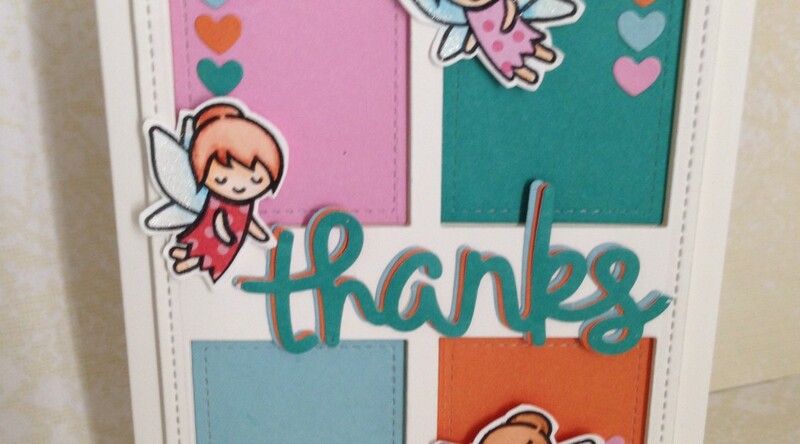 I used dimensional glue dots to adhere the fairies to the card base. Lastly, I added some Clear Wink of Stella to the fairies wings. Challenges, fun with paper and ink, Lawn Fawnatics Challenges, LOVE! A few weeks ago, I made a bunch of ink smooshed backgrounds. 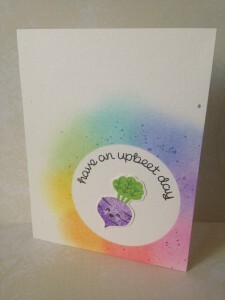 I made this card using one and will be entering it in the current Lawn Fawnatics Challenge. Extra Details: I began this card a few weeks ago by making the ink smooshed background. Using Distress Inks and an acrylic block, I applied color to some water color paper. I let the block sit on the paper for at least five minutes to get the intense color. I love the results of this technique. Once, I removed the block, I set the panel aside to air. 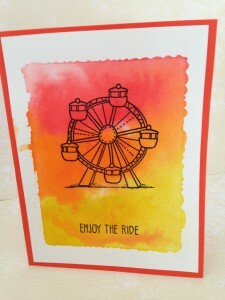 I love the Admit One stamp set from Lawn Fawn and colorful backgrounds. 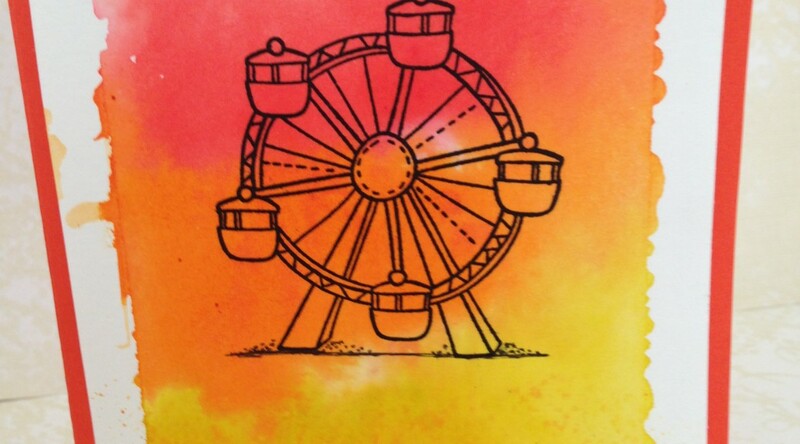 I stamped the Ferris Wheel and sentiment in black ink. I added the ground with a black Sharpie. I adhered this panel to an orange card base. Because of the colored card base, I decided to add a liner to the inside. I added some tickets to the bottom of the liner for added interest. The school my kids attend is having a basket auction fundraiser soon. I am donating a card set to the auction. 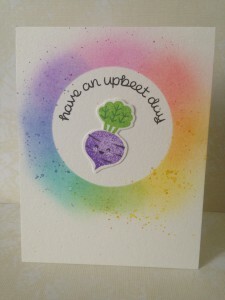 I choose to do a set of punny vegetable cards. 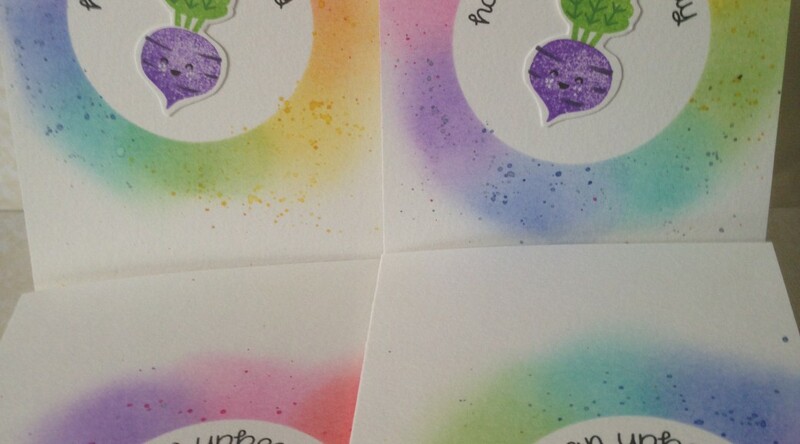 I choose this theme for a few reasons; a) they are fairly generic so the cards can be sent to anyone for almost any occasion, b) my kids school plants a garden every spring, and finally, c) I found a fun vegetable pun that made me laugh. This set used beets. 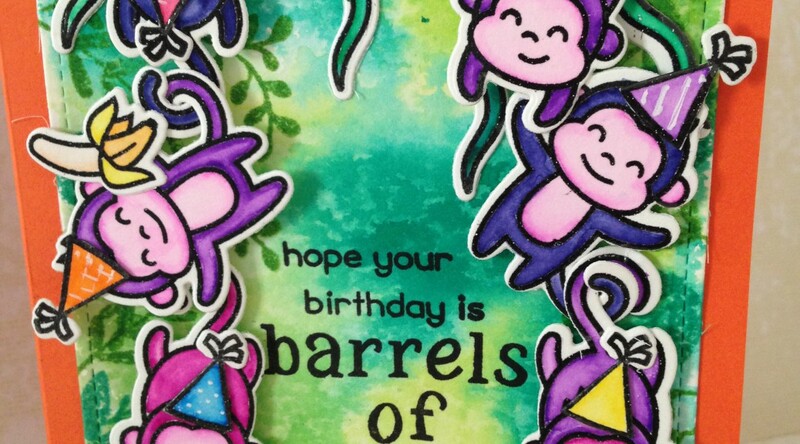 I used the same design for each card but moved the focal point around and rotated the colors around the circle. I did this to make each card interesting and individual. Extra Details: I started by making the card bases. 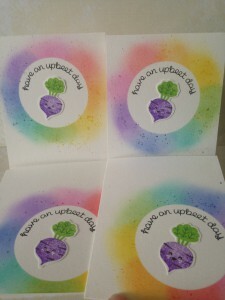 I had already made the radish cards with the variety of folds, so I did the same for this card set. 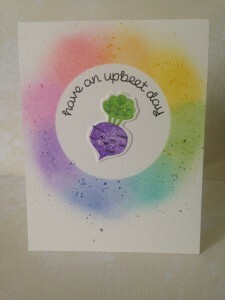 I used many of the same Distress Inks that I used on the Radish cards to create the background for these cards. I started by making a circle mask. I temporarily adhered the mask to each card base. 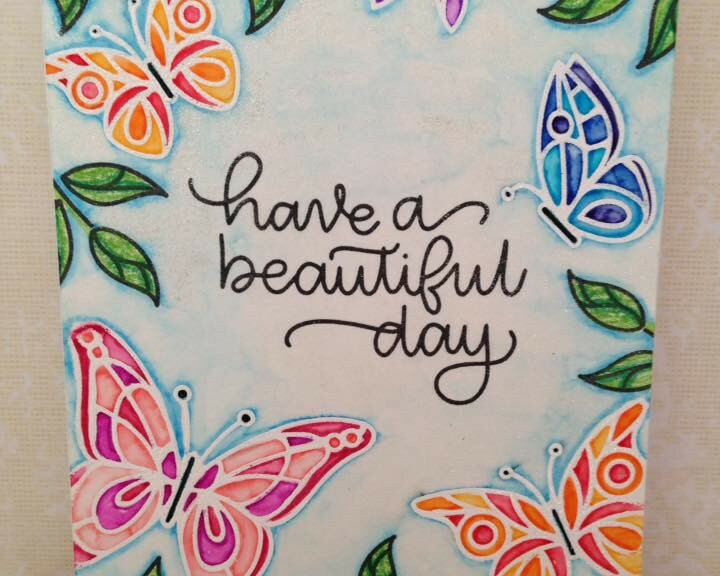 I used Mini Distress Ink Blenders to blend eight colors of Distress Ink around the circle. Then, I moved the mask to a new card base. I rotated the mask, so the colors would be in a different position on each card. Next, I decided to add some splatter to the card bases. I used pink, yellow, and blue Distress Inks to add the splatter. I replaced the mask and flicked some ink on to the card base. I tried to keep the splatter in its own area of the color wheel I had created. 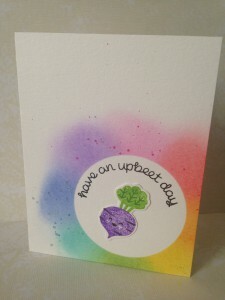 While the card bases were drying, I stamped the beets on a scrap of water color paper. I added the leaves, faces, and other details. Once the beets were all stamp, I fussy cut them out. Because the sentiment stamp is a clear stamp, I was able to bend it to match the curve of my circle. I stamped the sentiment in black ink. 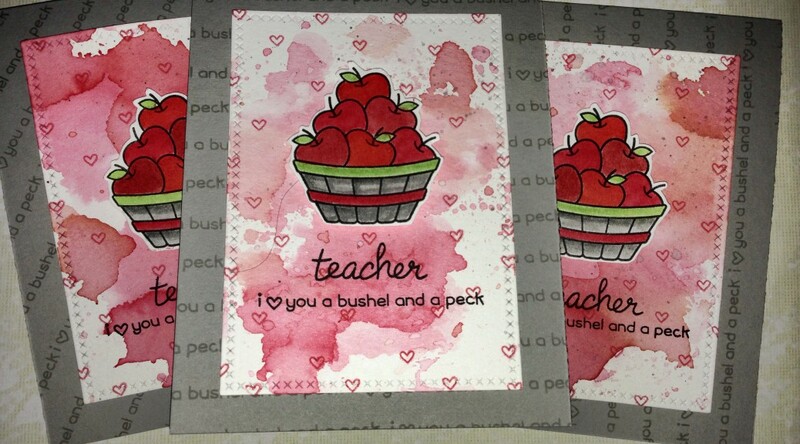 Lastly, I adhered the beets and the cards were complete. The owner of our favorite local pizza shop was sick this week. He also happens to be a family friend, so I made him this card. I will write a get well message on the inside of the card. 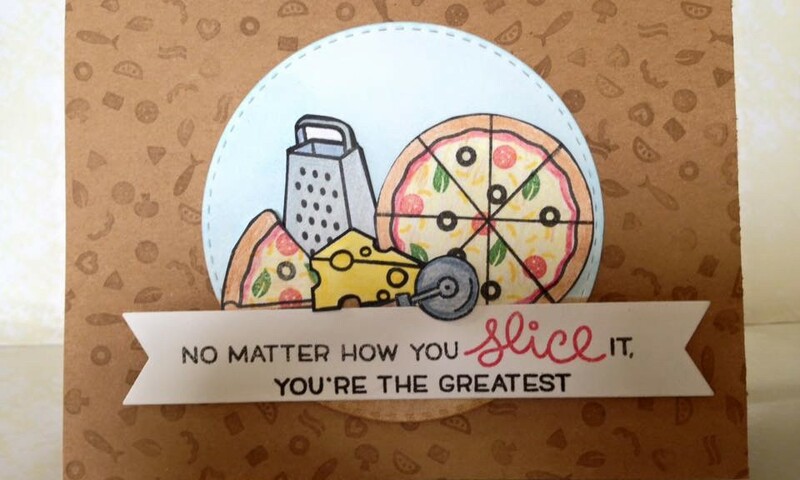 Extra Details: I started by stamping and coloring my pizza images. I used colored pencils to color the images. I added the topping with colored inks, once I was finished with the colored pencils. I used my Cutter Bee scissors to fussy cut out the images. I painted the edges of the images with a black marker to hide any cutting mistakes. Next, I used my die cut machine to die cut a stitched circle and a white banner. I stamped my sentiment on the banner. I used Distress Inks and mini ink blending tools to add color to the circle. I created a card base form kraft card stock. 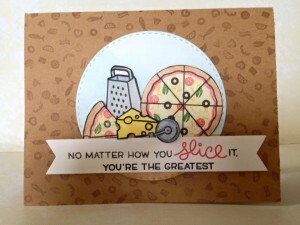 I stamped the toppings all over the card base using a brown ink. Once, I finished that, I adhered the circle die cut to the card base with a tape runner and some fun foam for dimension. To adhere the banner, I used dimensional glue dots and tape runner. I used small glue dots to adhere all of the other small images. My daughter just received a set of Crayola Fine Line markers as a gift. 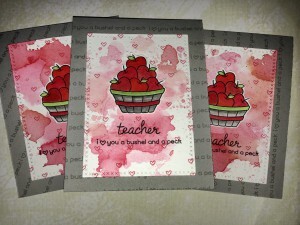 She very nicely let me use them to create this card set. I used a water brush to blend the color out and was very pleased with the results. Extra Details: I started with a full sheet of water color paper. I white heat embossed the Peep outlines all over the sheet. I used the Crayola Fine Line Markers to add a single line of color around all around the inside edges of each Peep. I used my water brush to add a very small amount of water and pull the color into the middle of each Peep. Once the Peeps were dry, I used a light blue marker to add color to the background. I added a line of color around the outside of each Peep and used my water brush to pull the color out. White this sheet was drying; I realized that I hadn’t added a sentiment…. So I got a half sheet of water color paper and stamped the sentiment and some more Peeps. 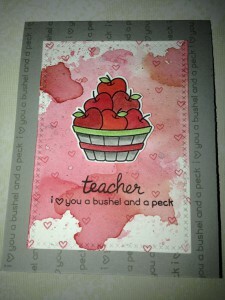 I used the same markers and technique to create the sentiments and the Peeps for the inside of the shakers. When everything was dry, I began die cutting. I used two Cross Stitched Rectangle dies to cut the outer frame and the inner piece for each card. I used the same dies to cut some frames from fun foam to use in the construction of the shakers. I used the coordinating Peep die to cut out each of the extra Peeps. I fussy cut out each sentiment. 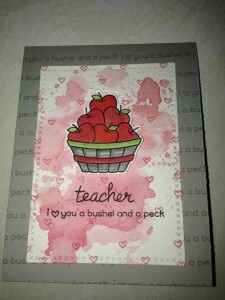 Next, I began construction my shaker cards. I adhered the inner rectangle directly to each white card base. I added the fun foam frame around the inner rectangle with strong doubled sided tape. Then, I adhered the clear plastic to the cardstock frame. I adhered the sentiment to the outside of the clear plastic. I added small piece of fun foam behind the sentiment. I added the die cute Peeps, some clear and white sequins to the well created by the fun foam frame. Then, I adhered the card stock frame to the fun foam frame. Lastly, I trimmed away any fun foam that was sticking out and the cards were done.